You may have read about mindfulness in a book, or taken a course or retreat, and been inspired by the possibilities. Inspired by the potential for transformation that mindfulness offers. And yet, there’s often a disconnect between our aspirations and our ability. How do you actually get to a place where your mindfulness is strong enough that you can be calm and fully present, no matter what the day throws at you? How can you use mindfulness to transform how you relate to your conscious experience? So you can experience the joy that’s present even in the most mundane acts of everyday life. So you can feel your emotions, without habitually reacting to them. So you can deepen your sense of connection and feel more grounded in your spiritual path. If you’ve wondered about these things, then you may be interested in a 30 day program that I offer a few times a year. This program is very intense and requires a considerable commitment, so it’s definitely not for everyone. This also isn’t the best course for absolute beginners. While I have had beginners in the course in the past, most of them agreed that they found it a little overwhelming and probably should have had more exposure to meditation and mindfulness practice before taking it. If you are a beginner, and you’re really clear that an intense deep-dive into meditation theory and practice is what you’re looking for, then you’re most certainly welcome in the program and we’d love to have you! In that case, you will get more out of the 30 Days of Mindfulness if you first go through the Mindfulness Crash Course, which will give you the necessary foundation to hit the ground running when the 30 Days of Mindfulness starts. If you feel that you’re ready to make a greater commitment to your practice and go beyond the generic, psychologized version of mindfulness that you find on the bestseller rack in most bookstores, then the 30 Days of Mindfulness may be a perfect fit for you. When you join the program, you get access to the 30 Days of Mindfulness website, where each week I post a series of videos covering the main topics for that week. 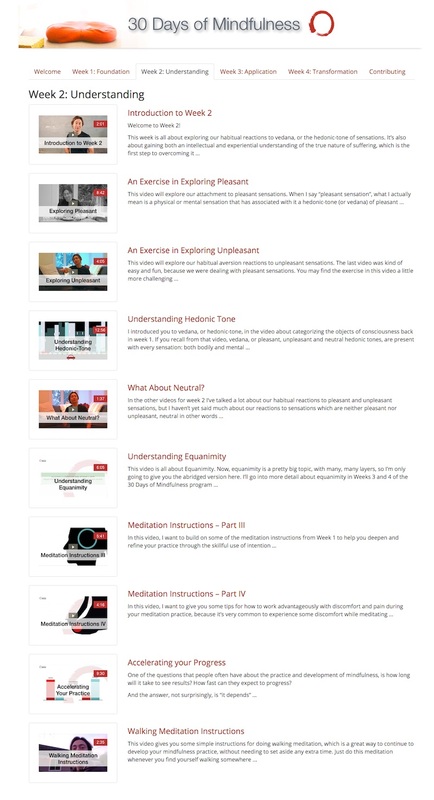 These videos include meditation instructions, guided practice sessions and important meditation theory that will help you understand the topic in greater depth. Over the 30 days of the program, I’ll guide you through a carefully developed progression in your practice. We begin with the basics and steadily lay down a solid foundation of mindfulness skills and knowledge. As you continue in the program, the videos shift in emphasis from meditation instructions to the application of mindfulness in daily life. These videos show you how to systematically apply mindfulness to positively and skillfully work with the common issues we all face, such as stress, anxiety, difficult emotions, procrastination and so on. 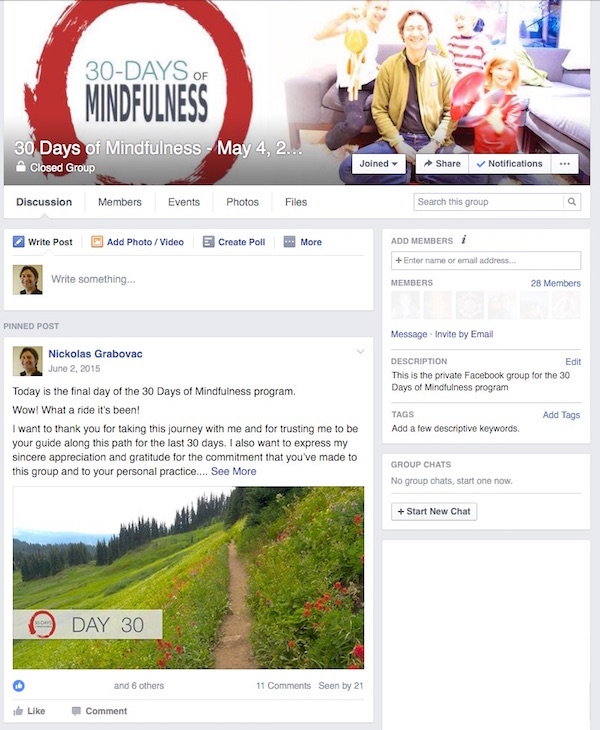 The interactive core of the 30 Days of Mindfulness program is a private Facebook group. It’s the gathering place that helps create a community of people who are dedicated to mindfulness practice and who will support you, encourage you and hold you accountable to a daily deepening of your practice. Every day during the program you’ll post a description of your meditation practice and your daily life practice for that day, including what you noticed, where you had difficulties and any questions you have. I’ll guide you in the specifics of what to pay attention to, clarify any confusions you may have, and suggest practice modifications to help you overcome whatever hurdles you’re facing. Other members of the group also join in the discussion to offer their experience and perspectives, and to support your ongoing practice. My teaching style is pretty no-nonsense. Joining the 30 Days of Mindfulness means that you aren’t interested in learning the popular, watered-down version of mindfulness. You want the real deal. I respect your intelligence and commitment by giving you clear, precise instructions with enough theory so that you understand exactly what you need to do and why. If anything doesn’t make sense, you can ask as many questions as you like until you feel confident in your understanding. This is the style of teaching that I most appreciate in my own teachers, and this kind of clear, precise instruction is what I’ve found has made the greatest difference in the development of my own practice. I feel calmer, happier, and more able to cope with difficult situations, and this is only the beginning! I enjoyed the well thought out Video presentations, and your conciseness. The daily posts were very helpful, and I looked forward to reading them. Your feedback was encouraging and helpful. I would just like to say a big thank you to you Nick, for giving me the opportunity to participate. I’ve learned so much, in such a short space of time. It feels like a life changing effect. I have benefited immensely from the program. I find that the mindfulness has helped me concentrate less on my problems and more on the good things that I have and I am a much happier person because of the meditation and mindfulness. Thank you so much for that. I liked the wealth of information that I was given and how I could apply it to my daily life. So many people think that meditation is some form of voodoo and it is nice to see a straight forward approach to it. The most important thing that people should know about this program is that if you follow it, it can truly change your life in a positive way. Thanks for all that you do. I have less mind chatter than previously, and am becoming more aware of each moment rather than thinking about what needs doing next and missing the moment I’m in. I also love that i am giving myself precious me time. Having a daily mediation session and moments of mindfulness, really allows me to give to myself (something i really haven’t allowed myself in the past). I would certainly recommend this program, as it has really helped me to become a calmer, more centred person. Thanks so much for this opportunity, it has changed my life. The 30DOM has helped me to focus my meditation practise as you explain the techniques and ideas behind them very clearly. Thanks! I wouldn’t hesitate to recommend it to anyone who wanted to learn to meditate or who was like me and got into a rut with their practice. And if I can finish it anyone can – it is clear and step by step and no pressure on one. The 30DOM has been a very useful experience. I now know I can improve my meditation practise with the skills you teach, and I’m happy that the support from you and all the participants helped me to carry on through the 30 days to complete it. Thank you very much. The 30DOM came highly recommended by someone that I trust. I’ve learned some new techniques to understand more deeply what happens when I meditate. And my practice has become more regular. I liked the clear, consistent and easy to understand instructions, with terminology that is accessible to all. Useful ideas to help clarify some points that might be difficult in daily life, like paying attention to body sensations when strong emotions arise. The real-life applications of the concepts (Mr. Mindful) are a light yet very truthful depiction of the results of increased mindfulness. I would highly recommend it to anyone who is learning to meditate. There is a lot of clarity provided around what it is to meditate, and how to train the mind in the activity. The 30DOM has given me some brand new ways to focus on my practice. I learned a lot from the goal setting and appreciate the nuances of a goal-less practice with goals. Also, the best thing I think was the practice of noticing the hedonic tone which was new to me. I had understood it from the Buddhist texts but not how to apply it. Being part of a group was very helpful, as was your feedback and knowing I was not alone in this practice. Also – Equanimity is key! This is one of the key learnings of this program. So many meditation teachers don’t understand this so don’t teach it and you explained it very well. The 30DOM is accessible, and only as challenging as one wants it to be but you’ll have all the support you need should you need it at any level of engagement. I have enjoyed and greatly benefitted from your straight forward, down-to-earth, knowledgeable, approach to teaching these skills. It is a unique approach to an area that can feel esoteric and ‘exclusive’ at times – or at least that was the story I was telling myself. I really enjoyed your daily posts, the organization of the course itself, the videos so that I could always watch them when I needed clarification. I enjoyed reading other people’s posts. I very much enjoyed the Q&A session with other class-mates. Mostly I felt encouraged in the skill of meditation and daily mindfulness – that is truly what I liked best. I would recommend this course to anyone who has even simple computer skills. I would whole-heartedly recommend it to those who find the concepts of mindfulness and meditation too “woo-woo”. Despite the fact you seemed to have fewer men than women taking the course, I think your approach is very friendly to the male gender because of your sense of humour (tasteful =) ) and your straight forward manner. I recommended MBSR to a few of my friends. I take that back….now I would recommend this course hands down. If you’re considering joining the 30DOM, you’ll benefit most if you can dedicate the time to watching the video resources each week (that’s a big one) and doing some form of daily practice. Nick is always there to answer questions on FaceBook and that he makes helpful supportive suggestions and comments along the way. Although this is online – you are not alone in your challenges and celebrations. The cost for participating in the 30 Days of Mindfulness program is $150 (US) plus any dana that you wish to give. The $150 covers my ongoing expenses related to delivering this program. It includes web hosting, video hosting, email software, the software used to build the course website, and all the rest of the “behind the scenes” infrastructure that makes the 30DOM possible. “Dana” is a Pali word that means “generosity”. Dana is the activity of giving, of being kind and generous — we often call it “practicing dana”. What makes this a practice is that sometimes the giving is easy. We naturally feel good about it, joy arises, and we can let go freely and give the gift without it hinging on any expectation of a return. Other times, it’s not so easy. It might be difficult to let go, there might be a lot of attachment there, or fear, or worry, and so on. We may have thoughts or feelings of guilt, or lack, or confusion. Whether in any particular instance giving dana is easy, or difficult, it’s an incredible opportunity to practice mindfulness. We can bring that alert, receptive, equanimous observation to the sensations associated with the act of giving. We can watch the stories in the mind that arise. And when you do this, you elevate giving from being something that is largely unconscious, something we perhaps do because it’s a custom, or because we feel guilty, or because it’s the “nice” thing to do, to something that deepens your understanding of the mind and your understanding of what letting go really is. Because, at it’s heart, dana is about loosening our attachments. I also gift a portion of the dana you give to help financially support my own teachers. In this way, you and I both participate in supporting something that we value and that has helped make a difference in our lives so that it’s available to others in the future. You may practice dana at any time after joining the program (traditionally, dana is usually given at the end). I understand that not every sincere student has the means to pay the $150, let alone offer a gift of dana. If that’s your situation, send me an email (nick@30daysofmindfulness.com). The 30 Days of Mindfulness is truly a labour of love for me. I spend several hours a day during the course interacting with the participants and improving the material based on their feedback. Because it’s such a large time commitment for me, I don’t offer this program very often. Unfortunately, that means that when I do offer it, the course tends to fill up very quickly, so I can’t guarantee a spot for everyone who may be interested. So, if you think something like this might be for you, I encourage you to sign up for the Early Bird List for the 30 Days of Mindfulness (see below). By signing up to this list, you’re telling me that you’re really interested in joining, and it allows me to give you priority for the next group. So, if you’re able to commit to meditating each day for at least 15 minutes (to start with), posting about your practice every day for 30 days, and you’re excited by the possibility of a deep dive into mindfulness meditation and it’s applications, then I encourage you to sign up for the early bird list for the next 30 Days of Mindfulness group. After you sign up, you can expect to receive some emails from me letting you know when the next group will be held. Don’t worry, if you change your mind later, you can unsubscribe from the list at any time by clicking a link at the bottom of any email you get from me. If you think something like this might be for you – you’re able to commit to meditating each day for at least 15 minutes (to start with), posting about your practice every day for 30 days, and you’re excited by the possibility of a deep dive into mindfulness meditation and it’s applications, then you should budget about 30 minutes to watch the following video. The video is called The Core Elements of Mindfulness: How to go Beyond Superficial Practice and Develop Mindfulness into a Life Transforming Skill. As the name suggests, it goes beyond the surface level of mindfulness that you’ll find in popular books and websites. 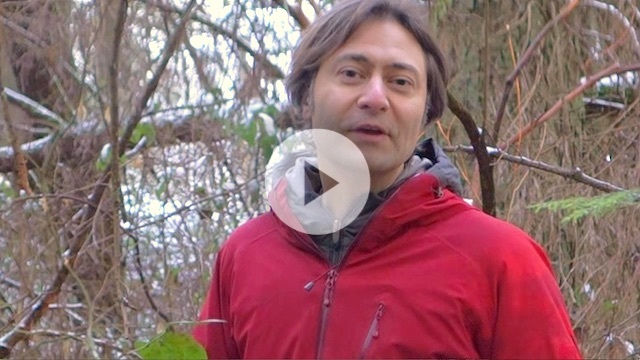 The purpose of this video is to show you the important, but often overlooked details that can make all the difference in your meditation practice, and in your ability to apply mindfulness in the chaos of daily life. I consider this video to be mandatory viewing for everyone who might be interested in enrolling in the next 30 Days of Mindfulness program (I’ll be announcing the opening of registration soon – probably in the next couple of weeks), because it will give you an excellent overview of what that program is all about. Whether or not you decide to join the 30 Days of Mindfulness program, I really hope this video helps to clear up any doubts or confusion you may have about your practice as well as inspires you to take it to the next level!